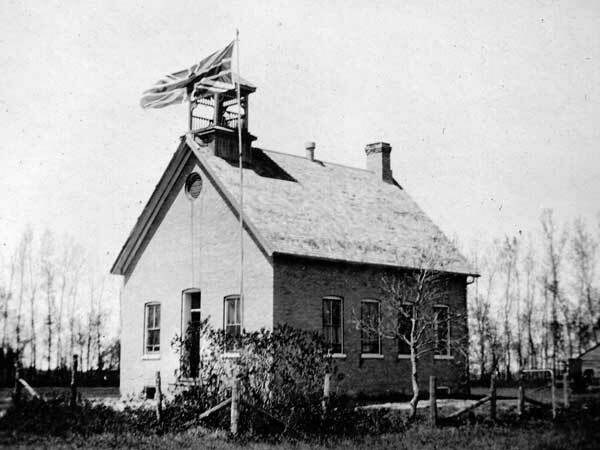 The McKenzie School District was established formally in 1882 and a one-room schoolhouse operated at SE20-2-9W in the Rural Municipality of Pembina. The original school building was destroyed by fire on 5 June 1905. The replacement school operated until in closed in June 1962. The district was dissolved later that year and its area was merged with La Riviere Consolidated School No. 516. The former school building was used as a community centre until late 1970. It was sold and moved away. 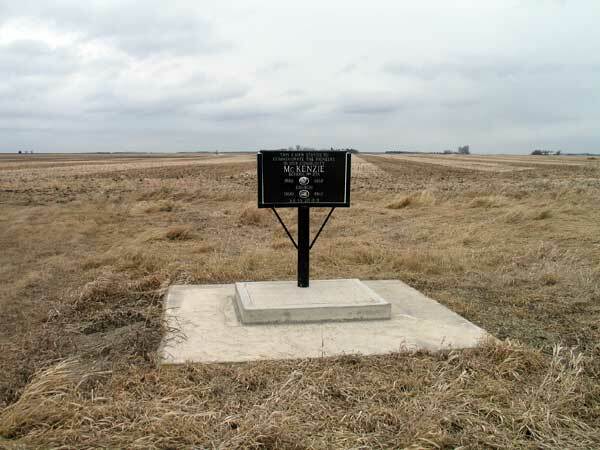 The monument at the site commemorates the school as well as McKenzie Church that operated nearby from 1900 to 1963. A cemetery associated with the church is located here too. Among the teachers of McKenzie School were Miss McLennan (1882), Miss Ethel Seed (1890), Miss Lottie Brooks (1891-1892), W. N. Denike (1893), Sam Brown (1894), W. P. Olds (1894), Charles Vrooman (1895), Ed Vrooman (1896-1897), E. B. Steele (1898), Miss Ella Flanagan (1899-1903), Miss Lily Gayton (1905-1908), Sadie Ferguson, Nellie Shewfelt, Bert Durham, Miss McFadden, Hilda Evett, Miss Christie, Miss Kinley, Miss Hicks, Evelyn Louise Kirkpatrick (1936-1937), Albert Walter Wurham (1937-1938), Mary Aileen Dale (1939), Kennetha Louise Statham (1939-1940), Edna May McDowell (1940-1941), Muriel Cook (1941), Mrs. May Penman (1942-1945), Dorothy Aileen Richards (1945-1946), Dorothy Mae Milljour (1946-1947), Donna Ellen Lusignan (1947-1948), Janet Margaret Peckover Cousins (1948-1952), Iris Merle Reeves (1952-1953), Fern Agnes Finnen (1953-1954), Marion Alice Dyck (1954), Margaret Irene Bergner (1955), Frank Froese (1955-1958), Joyce Hazel Gardiner (1958-1959), and Lois Ellen McKinney (1959-1960). GR8461, A0233, C131-1, page 83. Manitoba School Records Collection (GR5330), McKenzie School District No. 235 Daily Registers, Archives of Manitoba.